Spectacular views, fabulous infinity swimming pool and jacuzzi/spa. The Mediterranean Suite - beautifully equipped and very new top floor apartment. This secluded, gated complex has the 'wow' factor! WELCOME! The luxurious Mediterranean Suite with its gorgeous views is nestled in the hillside only 3 minutes walk from the centre of Peyia, a typical Cypriot village famous for its views, tavernas, tree-lined village square and Greek supermarket. We are now taking winter bookings at inexpensive rates. Please ask us for the details. Come for a month and enjoy fabulous sunshine and rates. German guests who stayed said that Suite was: 'Perfect' 'Wonderful'! It's a wonderful place to come and relax and soak up the Mediterranean sunshine! I'm writing this (below) on 14 December and the sun is hot, the temperature about 72 degrees F. The sky is blue and the ocean sparkles. The winter and early spring at The Mediterranean Suite are fabulous! The island boasts 326 days of sunshine each year. Come and enjoy! This is a secluded property in an upmarket, small, gated community. The whole property, including the infinity swimming pool and jacuzzi has the 'Wow' factor! Many guests call it 'fantastic' and 'paradise'. The property is suitable for adults and children 12 years of age and over. A 10 minute drive takes you to Coral Bay where there are some of the island's best beaches. The beautiful Akamis Peninsula is only 5 miles away. Here is Lara Beach where turtles nest and you can often see baby turtles during the summer. Relax and enjoy the beautiful infinity swimming pool with its jacuzzi/spa, sun-filled terrace and fabulous views. There are stunning views from the luxurious top floor suite over the Mediterranean Sea, Coral Bay, Banana Bay, the mountains and Paphos. The views from the covered balcony become almost magical at night. We love Cyprus and our home at The Mediterranean Suite. We hope you do too! Bedroom 1 - double bed, stunning ocean views, spacious Italian wardrobes. Luxurious winter duvets, rattan chair, bedside tables with lamps, air con, fan. Bedroom 2 - double bed, spacious Italian wardrobes, table, chair, bedside lamp, air con, fan. Main bathroom travertine floors with bath, shower, large mirror, WC, washbasin, travertine stone floors in both bathroom and en-suite. Hairdryer. Towels. En-suite shower room with large shower cubicle, glass sliding shower doors, WC, washbasin. Towels. Italian designed fully equipped kitchen, Bosch appliances: dishwasher, cooker, hob, large fridge/freezer. Silver granite worktops and spacious breakfast bar. Padded silver designer stools. New microwave, teapot, kettles, toaster, coffee maker, CD player. Top of the range Bosch washing machine is in a screened alcove leading from the hall. 2 airers for drying clothes. Sitting room with two 3-seater settees, flat screen TV, DVD player, CD player, radio. Crystal chandeliers. Beautiful views to the balcony. Dining area with glass top table, 6 chairs. Next to balcony for lovely views day and night. Huge Cypriot mirrors. This is a top floor suite and there is a lift available always as well as stairs. Property managed by onsite cleaner/manager who keeps it immaculate. Fresh, high quality towels and all bed linen is included. Beach towels are also included for your convenience. Luxurious winter duvets in bedrooms. Shared infinity swimming pool and jacuzzi/spa pool, Parking. Dishwasher, Fridge/Freezer, Hob/Stove, Iron, Microwave, Oven, Washing Machine. Air Conditioning, Central Heating, Cot, High Chair, Internet Access, Room Fans, Satellite, TV. There is access for disabled people using the Otis lift. Please check with the owner. The penthouse apartment is on the second floor. Access is via lift or stairs. There are buses from the village square to Paphos, Coral Bay and the start of the Akamis Peninsula. These make a holiday without a car easy to arrange here. Do ask us about being met at the airport and also for a timetable of the is a great service. There is plenty of onsite parking and because the property is secluded and located in a village this is a very safe area. 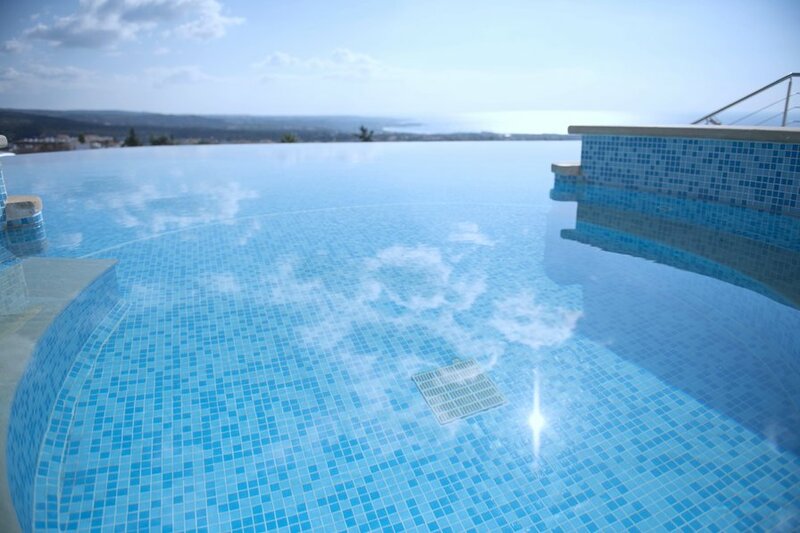 You can relax in the beautiful infinity swimming pool with breathtaking Mediterranean and mountain views. The pool has an attached jacuzzi/spa. There is an ipod docking station with speakers. WC room is at this level. The terrace around the pool has plenty of sun loungers where you can soak up the sunshine and large parasols if you like some shade. The terrace is paved with sandstone and the whole outside area has a luxurious feel. The pool area has featured lighting giving it a magical feel at night and making it a place to enjoy your evening meals and cocktails. The whole complex is small, private, secluded and has the 'Wow' factor. This is a gated community and has been described as one of the most beautiful properties on the island. Each spacious bedroom has beautifully comfortable double beds. Almost everyone who stays says they sleep exceptionally well. The main bedroom has stunning views out to the Mediterranean and the second bedroom is cool and has hill and country views. A welcome pack (tea, coffee, water, milk, freshly baked bread, butter, marmalade) is provided for you when you arrive. If you are travelling with other families and would like to be together we have details of other apartments that can be rented during the same period. There is very efficient air-conditioning for the summer, and warm air heating for any exceptional cool weather in the winter. State of the art air-con/ heating. Prices are for the property per week and are in Sterling, UK pounds. Discounts for long lets and multiple weeks will be given on request. We are open to having you stay for any length of time. Please send a message and we will always do our best to accommodate you. We hope you enjoy your holidays! Currency can be exchanged at a very good rate in various shops in Paphos. Ask us for details. Our changeover days are flexible. Arrival and departure times will be arranged with you and we will always try to accommodate you to make your holiday as relaxing and enjoyable as possible! The management company will check the penthouse apartment before you arrive and immediately prior to your departure. The onsite managers will be on hand to help with anything you require. Coral Bay has some of the finest beaches in Cyprus. It is a 5-10 minute drive to Coral Bay. The Akamis Peninsula, reputedly the most beautiful area of Cyprus is about 5 miles away. Here are more sandy beaches with very few tourists. Lara Beach, the turtle nesting beach is on the Akamis, about 8 miles from the penthouse apartment. During the summer you should be able to see baby turtles. Further to the north is Latchi and Polis with lovely fishing harbours, marinas and beaches. This area of Cyprus is known as the fairway to Heaven! The golf courses in the area are of a very high standard and the views and scenery are spectacular. Minthis Hills Championship Golf Course is about 20 minutes away. This has a new island hole and is a lovely mountain top course, cool in summer. It is well known for its uniqque undulating terrain. A new clubhouse is about to Aphrodite Hills is an outstanding Championship Course with breathtaking views. It is challenging for amateurs and the more experienced with a dramatic gorge running through the course. Secret Valley, another beautiful course, (about 40 mins) has a spa. Elea Golf Course (25 mins) has recently been opened by Sir Nick Faldo and has already proven to be a new star for the island. We are spoilt for choice in this area of Cyprus! Golf pros are always at hand. Exclusive lessons for juniors as well as beginners are available. Cyprus is the new golfing jewel in Europe. The Troodos Mountains have good pistes for skiing usually December to March. (Please check for local conditions). The mountains are just over 45 minutes away. The drive is spectacular, winter or summer. Traditionally on Christmas Day, people ski in the Troodos Mountains during the morning and drive to the beach to sunbathe in the afternoon. We think that Cyprus during November to April can often be the best time of the year. It is often warm during February in particular, with beautiful evenings and lovely days. Our prices are much cheaper then and we offer a monthly rate for the winter lets. Plenty of off road parking. Covered balcony. Pool area has plenty of space with sun loungers.